Can disabled athletes outcompete able-bodied athletes? Well before Oscar Pistorius was first granted leave by the International Athletics Federation to compete in the Olympics, sports fans had questioned whether disabled athletes would ever outcompete their able-bodied counterparts. At the 2012 Olympics in London, Pistorious became the first double-leg amputee to compete at both the Olympics and Paralympics. Finishing second in his heat, he did, in fact, beat several able-bodied competitors. Other athletes to compete in both the Olympics and the Paralympics include archers, table tennis players, swimmers and equestrians. Nevertheless, no disabled athlete has ever won a medal at both the Olympic and Paralympic games. Consequently, with technology constantly advancing, people continue to wonder how long it will be until disabled competitors will come to dominate a sport. Well wonder no longer, it has been happening for years in athletics distance events. In fact, in every distance race further than 400 metres, the world record times of wheelchair athletes are faster than their able-bodied counterparts. Times for the marathon present the most stark difference. The men’s able-bodied world-record time is two hours and three minutes compared with the fastest official wheelchair time of one hour 20 minutes. Even over 800 metres Marcel Hug’s record of one minute 31.12 seconds is almost 10 seconds faster than David Rudisha’s London 2012 world-record winning time of one minute 40.91 seconds. Similar trends hold for the women’s world records, although the differences are less pronounced. In both men’s and women’s events the fastest wheelchair racers are in the T54 category. Athletes in T54 have normal arm muscle power and have partial-to-normal trunk control. T54 competitors include Britain’s David Weir, a four-time Paralympic gold medallist at the London 2012 Olympics in distances from 800 metres up to the marathon. T54 also boasts Marcel Hug, the man with the astounding achievement of being world record holder in the 800 metres, 1,500 metres, 5,000 metres and 10,000 metres. The thought of able-bodied athletes dominating over such a wide range of distances is inconceivable. How is it that a single athlete can dominate over such a wide range of race distances? As the distance of a race increases it is reasonable to expect that the average speed at which the racer travels should decrease. This is true for all distances over 200 metres (in 100m and 200m races wheelchair racers are significantly hampered by their slow starts) for both able-bodied and wheelchair racers. However, wheelchair racers maintain their average speed much better. At 400 metres the average speed for the world record wheelchair race was 8.88 meters per second (mps). Astonishingly this drops to only 8.77 mps over the 26.22 miles of a marathon. For able-bodied athletes the corresponding drop in speed is from 9.30 mps (Wayde van Niekerk’s Rio 2016 world record) to 5.72 mps (Dennis Kimetto’s record 2014 Berlin marathon time). It seems, in wheelchair racing, that if you are fast, you can be fast over all distances. 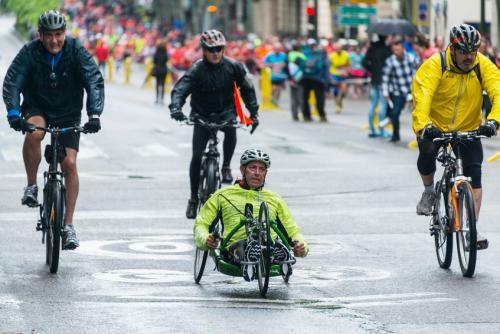 This may be the case but why, in these middle to long-distance races, do wheelchair racers enjoy such an advantage over their able-bodied rivals? The answer is largely technological. In the same manner as a bike, a wheelchair is a machine which can help the athlete using it to move faster than an equivalently athletic runner. For elite racers, wheelchairs are customised to the millimeter. Bespoke aluminium frames are constructed to provide narrow profiles which reduce aerodynamic drag in comparison to able bodied runners. Athletes are positioned in the chairs in order to push as efficiently as possible. On flat or downhill sections of races, athletes are able to coast to recover or conserve energy, whereas able bodied runners must keep expending precious energy even on downhill sections. That being said, it’s not all plain sailing for the wheelchair athletes. Track races require them to negotiate two bends every 400 meters and bunched conditions make overtaking particularly difficult. Road races – which have fewer bends and are less crowded – have their own issues. Camber on a road can cause athletes to head toward the kerb requiring continual correction, placing increased strain on one arm or the other. Uneven or poorly maintained road surfaces also present problems to wheelchair athletes, including the possibility of punctures. Although wheelchair competitors may gain some advantage on significantly downhill courses, for a world record to be ratified the course has to have a minimum decrease in elevation. This is why South African Ernst van Dyk’s one hour 18 minute Boston marathon time is not a true world record. As most cyclists know, on significantly undulating “legal” courses, times are almost invariably slower than travelling the same distance on the flat. The increase in speed on downhill sections never makes up for the extra energy expended and the extra time spent pushing up hill. Despite these disadvantages, wheelchair Paralympians continue to outperform their able-bodied counterparts. With further advances in wheelchair technology they will continue to do at this Paralympics and for many more to come.